President Obama delivered his final SOTU. 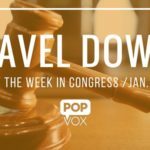 Congress passed a soon-to-be-vetoed resolution disapproving a new water regulation, the Senate failed to advance a bill to audit the federal reserve, the House took steps to tighten sanctions on North Korea, and Speaker Ryan showed House Members what "gavel down" really means. 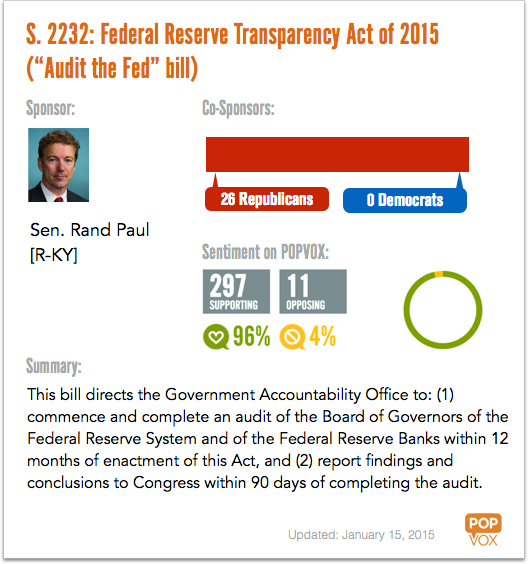 The Senate considered a bill from Sen. Rand Paul [R, KY} to require an audit of the Federal Reserve. By a vote of 53-44, the bill did not reach "cloture" to end debate and proceed to a vote, which requires 60. Read more from The Hill. On Tuesday, President Obama delivered his final State of the Union Address to a joint session of Congress. Read the full text on Medium. 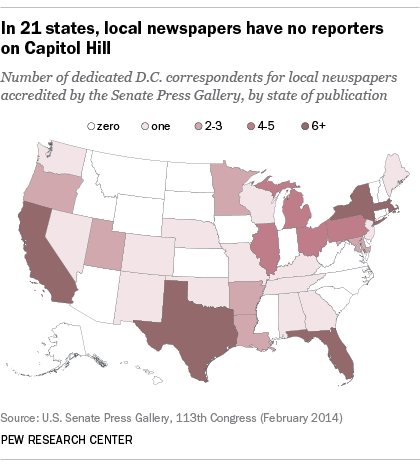 (Follow POPVOX for annotations and links to bills.) Watch the speech on CSPAN. This week, the House passed a resolution (253 YAYS – 166 NAYS) leveraging the "Congressional Review Act" to "disapprove" a new EPA and Army Corps regulation that expands the definition of the "Waters of the United States," protected by the Clean Water Act. The President is expected to veto the resolution. The Congressional Review Act (CRA) gives Congress sixty “session days” to overturn a rule issued by the Executive branch. Read more from the Congressional Research Service. While forty-seven CRA resolutions have been introduced since 1996, only two have passed both houses and only one rule has been disapproved by Congress — the Department of Labor rule on ergonomics. It’s pretty tough for a CRA resolution to succeed in its attempt to invalidate an administrative rule, because it is usually subject to a veto by the very executive whose administration issued the rule in the first place (i.e. the President.) The special circumstance in the successful case was that incoming President George W. Bush opposed the rule and signed the CRA resolution that was waiting for him upon his inauguration. Speaker Ryan wrote an op-ed for the Omaha World-Herald, detailing his opposition to the rule. On the heels of last week's nuclear test by North Korea, House passed bill that would impose harsher sanctions. The North Korea Sanctions Enforcement Act (H.R. 757) passed 418-2 — with Reps. Amash [R, MI-3] and Massie [R, KY-4] in opposition. If you normally think of sanctions coming from the executive branch, you're not wrong. It's a somewhat unusual step by Congress but within congressional authority. The legislation is aimed at reducing financial assets that are used to develop nuclear weapons. It would target foreign companies doing business with North Korea, reduce North Korea's access to U.S. financial markets, and authorize the U.S. to sanction any entities transferring assets to North Korea. In the past, Senate bills that would impose sanctions on North Korea have not moved as quickly. Members of the Senate Foreign Relations Committee were briefed in a closed hearing on Monday, and Senate Majority Leader Mitch McConnell [R, KY] said the Senate will take up similar legislation soon. Tardiness when voting continues to be a problem in the House. Speaker Ryan lectured Members last week — saying Members should attempt to make it to the House floor within the prescribed 15-minute voting period. This week Speaker Ryan sent a clear message that he means business. The Iran Terror Finance Transparency Act (H.R. 3662) hit the House Floor on Wednesday. There's been lots of talk surrounding the bill that would give Congress increased oversight over the Iran nuclear deal. Reps. Royce [R, CA-39] and Engel [D, NY-16] wrapped up arguments and a 15 minute vote began. 15 minutes came and went, and 137 members had not voted. "They closed it," said Rep. Steve Stivers [R, OH-15]. "They need to learn." Speaker Ryan, Majority Leader Kevin McCarthy [R, CA-23], and Minority Whip Steny Hoyer [D, MD-5] huddled together to devise a solution. The vote was vacated, and the House will re-vote on Jan. 26 — when sanctions on Iran will have begun being lifted already. One of the three House committees with jurisdiction over legislation affecting Puerto Rico's debt held a hearing this week. The House Committee on Natural Resources examined the circumstances that led to Puerto Rico's $73 billion debt crisis — specifically the state-owned and self-regulated monopoly Puerto Rico Electric Power Authority (PREPA) that serves as Puerto Rico's public utility. Several legislative proposals exist, including declaring bankruptcy, creating a "superbond" to restructure debt into a single bond, and imposing austerity measures and cutting the size of Puerto Rico's government. Senate Minority Leader Harry Reid [D, NV] wants to create a task force of six to eight senators who would devise a legislation solution by the end of February. Proposed North Carolina law would require doctors who perform an abortion after the 16th week of pregnancy to submit an ultrasound to state officials. SCOTUS struck down Florida's death sentencing system — saying a jury (rather than judge) must make the final decisions whether to impose a death penalty. Pentagon posted latest costs for #ISIL operations: averaging $11.2M per day since Aug. 2014. New Gallup poll finds that Americans who identify as "Independents" tend to lean toward one party and vote with that party — suggesting independent voters aren't much different than partisans when it comes to voting. The Chronicle of Higher Education unveiled new project tracking colleges and universities and possible Title IX violations involving sexual assault complaints. House passed bill to protect unpaid government interns from discrimination. Companion bills would extend protections to unpaid interns working in congressional offices and the private sector. 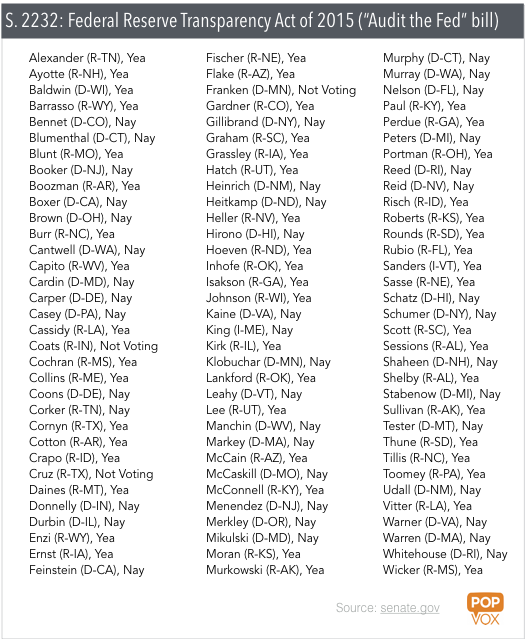 Confirmation votes continue to pile up in the Senate. Eric Fanning stepped aside as acting secretary as "a show of comity" to the Senate. Vice President Joe Biden met with top cancer researchers to discuss "moon shot" to cure cancer. House Energy & Commerce Chairman Rep. Fred Upton [R, MI-6] sent a letter highlighting the 21st Century Cures Act (H.R. 6) and encouraging the Senate to come to the table. Rep. Mark Takai [D, HI-1] wants to be able to wear Aloha shirt on House floor. Rep. Frank Pallone [D, NJ-6], ranking member of the House Energy & Commerce Committee, circulated a draft of the Viewer Protection Act, which addresses consumer-friendly repack of TV stations after upcoming incentive auction. House Democrats circulated a letter calling on the Obama administration to halt deportation raids and grant Temporary Protected Status until the administration can guarantee those being deported won't face violence in their home countries. Top-ranking Democrats on House Energy & Commerce Committee sent a letter to EPA and Dept. of Transportation, inquiring about the agencies' roles in the SoCal Gas leak and if there is jurisdiction to expedite the process. One of the biggest applause lines from President Obama's State of the Union was a call to action for redistricting reform. The folks at Wonkblog reworked congressional districts based on compactness. Rep. Devin Nunes [R, CA-22] introduced a bill to lower the maximum tax rate on all businesses to 25%. The bill would move the United States to a territorial system, where companies are only taxed on income earned in the U.S. The Fix found that political parties grew closer together around WWII, started splitting in the 1980s, and now are further apart than at any other point in history.